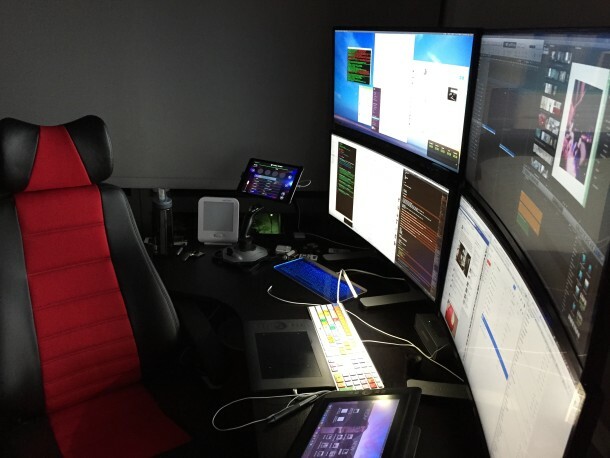 This weeks featured Mac setup is the amazing quadruple tiled display desk of Teemu A., who uses this great workstation to run and manage a startup. Let’s jump right in to learn more about the hardware and software used to get things done. Tell us a bit about what you use your Apple gear for? I’m running a startup with currently 32 live products, an 8 people development team and a 3 people production team for 16+ hours per day, across many timezones – it’s essential that I’ve got maximum productivity at all times, all the critical info available, and no second guessing about where everything is. Due to the hectic schedule and the fact that it’s needed to switch ‘hats’ on the fly several times a day, this setup really makes things effortless and let’s me focus on getting the job done. What hardware makes up your setup? Why did you go with this specific setup? This setup allows me to run high volume of apps and tasks simultaneously – I previously tried fully loaded MacBook Pro and iMac and literally ‘fried’ both within a year… at the moment there’s little headroom to grow which is for the first time, awesome. What apps could you not do without? Of course I should say my own productivity app with timezone task management here too, and Wirecast which makes the online meetings look really slick. Do you have a favorite app for Mac or for iOS? Others – at the moment there’s nothing “cool” out there anymore… Keynote used to be my swiss army knife but then something happened to Apple and they don’t seem to understand anymore where the world is heading and what Keynote in 2015 should be / do. When managing multiple projects at the same time you really need to think forward quite a lot. In my case that means pre-scheduling emails, social media, tasklists… I also automate a lot of tasks with small in-house apps or AppleScripts, most important ones are stack of pre-written replies to emails, Dropbox folders ready to be shared when time comes. All automated with scripts either via timer or manual button from our own productivity tool. I also keep everything in sync, so if I step outside of the ‘command center’ I’ve got same ToDo list running with task timers on all devices simultaneously, so for being outside it often looks that I never really left the office. Do you have an interesting Mac workstation you want to share with OSXDaily? It’s pretty easy, answer some questions about your setup, take a few good pictures, and send it all in. Go here to get started, or you can opt to just browse through previously featured Mac setups too. Wow nice, what stand can hold the four monitors like that? This must be a 2014 Mac Pro too? Seeing these setups makes me want one, but it also makes me wonder about Apples commitment to the pro user… Mac Pro is … well you know the story. And the Retina MacBook Pro is good, but could be beefier. Can we have the exact ref of the stand you use? Well, I can see where the cash is burned up and why so many startup’s fail so quickly. You do know that VC’s want the company to spend the money they invest in the company, right? That means talent, salaries, acquisitions, hardware, perks, you name it, they want you to spend it. Same on a grander scale too, every earnings call everyone and their mother is bugging Tim Cook to spend Apple’s cash pile… spend spend spend is the demands of the banks and the big share holders, so they buy back stock, issue dividends, etc. Corporations in a nutshell: spend money to make money. 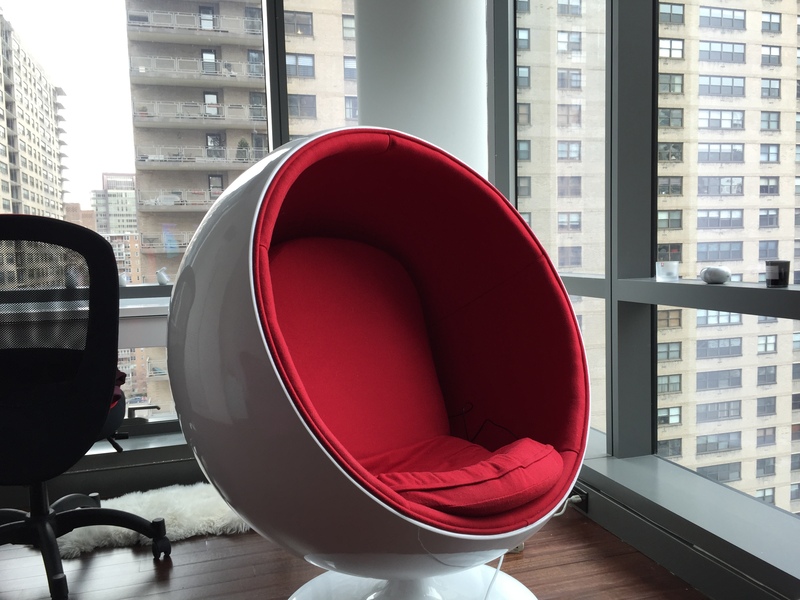 I was wondering the same thing, love the chair look. And the desk setup is great too, must be great to have 4 screens! I have two and I love it. what desk/table is that? Anyone knows? Been looking for a good inexpensive solution for my home office that fits 2 monitors, is ergonomic, that lets me rest a good part of my forearm on the table when I use the mouse. I can see this setup is also, ‘because you can’. And that makes flying or gaming (the joystick) a lot nicer….! Would be good to know the name of your company and your apps? Great setup! I love the monitors. $25,000 Mac Pro setup. Nice. Can someone tell me what monitor stands those are? Can you tell me how do you connect the 4 monitors? I are they connected to the same mac? The new Mac Pros can drive all these monitors. The Dual D500s have the ports. Hmm. Not impressed, actually. I’d like to know what startup blows this kind of money on this kind of hardware. What secondary backlit keyboard is that? 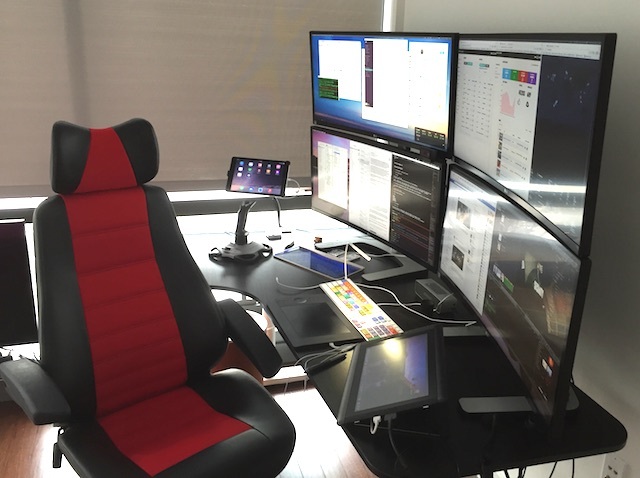 At first glance, I thought the owner of this set up is a trader….. Love the curved monitors! Acer Predator XR341CK (coming by June). I used to use a 2×2 setup like this, but with four Lenovo 22-inch 1920×1200 monitors, two of them driven by DisplayLink USB adapters. Then I split that setup in two to use one vertical stack at work, the other at home together with the GiMeSpace Desktop Extender, an $18 software utility that lets me create a virtual desktop as large as I please. Teemu: We’re in kind of the same business, with a lot of the same goals. I’d love to have some regular correspondence about our work. You’ll figure out how to find me. dunno what loan you’re talking about – our business or me don’t haven’t loaned a penny since 90’s..and for your earlier comment – of course it all can be done with $200 PC but same way you get across country by bus..or you can fly. nice setup… I’m just amazed how many haters are kindof “complaining” about the money spent… Guys, whoever paid for this, it’s smart, it’s called a productivity tool ! Are you daisy chaining the DisplayPorts between the monitors? Very nice setup. I was wanting to know what kind of desk you have in your setup? Teemu, what an impressive setup you have going on there…..! I’m blown away. What do you use for sound. I see what looks like a small rectangular speaker below the monitors. I love the haters too, worrying about the money spent on you’re setup…! Thank and good luck to you……..! Cool setup, but i understand the criticism, especially if the argument is that vcs want their money to be spent in the company. Or is your product this “productivity tool” itself? Anyway i certainly looks cool and most probably is a lot of fun.